Please check the network cable 2 end connection is correct. Network switch is not allowed to use in between the cable. Our extender is USB 2.0. So it does NOT support VR equipment and other devices that need USB 3.0 transmission rate. This version does NOT support audio transmission for a while. 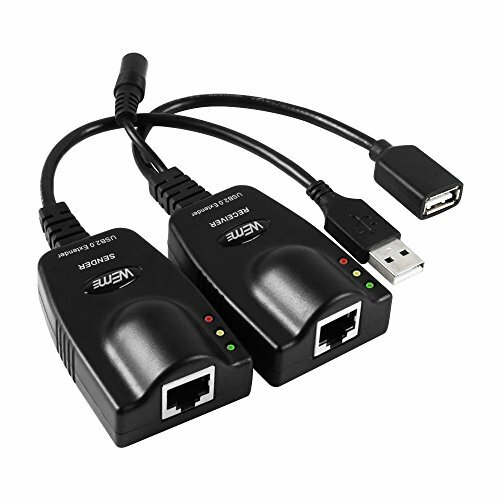 If you need this function urgently, please purchase updated version (ASIN: B01MRL2SK1), which is 4-port USB Extender (60M). True Plug and Play. No drivers needed for you to enjoy its outstanding performance. If you have any questions about this product by WEme, contact us by completing and submitting the form below. If you are looking for a specif part number, please include it with your message.